Yes, this is a post about grinding. No, don’t just run away! I’m aware that this is not exactly the most popular game mechanic ever invented, but there’s more to it than meets the eye, and certainly more than the “Bring me 100 frog ears” treadmill that defines so much of the MMORPG genre. In any case, the first problem here is to define what we’re actually talking about. 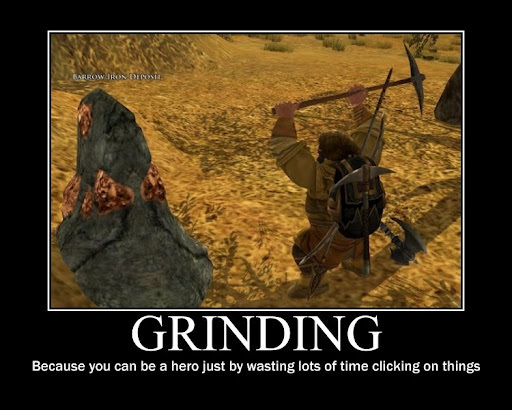 According to some Wikipedia entries, grinding means just about any repeated activity in RPGs. That may be a little broad: If we beat a mid-game boss with a well-filled treasure chamber and end up with two dozen magical items, is the repeated cycle of identify/compare/sell already grinding? Not as it is commonly used, I’d say. Gaining rewards: Usually, grinding is there for a reason. 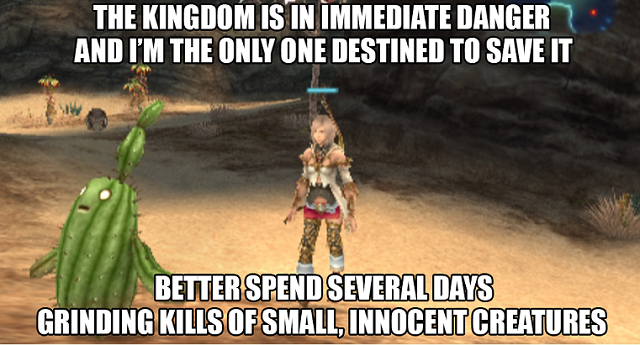 You don’t just slash down monsters by the hundreds because they are there, but because that slashing yields experience points, money, item drops. Low risk for the reward: Now if you’re doing battle after battle after battle (or whatever process is currently at hand), the outcome of these battles must be predictable – in fact, it must be close to “win without a scratch”. If it was somewhat risky, you might end up spending more resources to win the fight than you would gain by winning it. This is all fine if you are doing a battle once, preferably to advance in a vital quest, but not exactly ideal if you want to be going through endless chains of battles, earning a large stack of (individually miniscule) rewards along the way. So – low risk. Mindlessness: If we consequently follow the “low risk”-path to the end, we land at a point where the respective grinding activity consists of nothing more than thoughtless clicking. If the outcome of a battle is certain, it apparently can be won with a minimum of concentration. Hence, it boils down to an automatic repetition of the same clicks over and over (which, again, some part of the audience is quite happy with). Necessity: This one’s a little tricky. There are cases where it’s obvious, say, if a grinding quest blocks the path to further progress in the storyline (note: don’t do this). Often it’s not that blunt; for instance, you might notice that you’ll need a higher level or better equipment to make it through the next areas, and grinding in the current area is a sure way to acquire it. Finally, it may be that advancement by grinding is not exactly necessary but still the optimal play: This happens when the game is designed to continue with challenging encounters, but the challenge can be considerably reduced by grinding beforehand. The developer may not have given this option much thought, because who would spend hours and hours mowing down the same boring, respawning critters? Turns out players will do this if they think it is the optimal play, even if they do not like the process at all. If we combine all of those elements, we arrive at a process most everyone will recognize as grinding, and also most everyone will hate. Not much to add here. And to be honest, in the vast majority of grinding quests I think we’re just looking at lazy game design. “No, you may not enter the royal castle until you have proven your worthiness. You do this best by killing 100 goblins.” And while I can understand the people who, after a long day at work, just want some predictable and not too stressful activity that still advances the game (“Yay! Level 29!”), this is not a reason for which I ever would include it in a game of my own. Still, there are circumstances under which grinding can add to a game. It is also possible to approach it from a different vantage point, moving it away from the standard “run in circles in a given area until you have encountered 77 wolves”. However, all of this assumes that with the grinding comes a reward, because otherwise it does really nothing than artificially prolonging a game; self-generated boredom, if you so will. The best use for including grinding will frequently be as a fallback option. No matter whether the player has found all sidequest dungeons, won all battles with the least possible resource consumption, spent the found gold efficiently or advanced her character accurately, all deviations from the one true path can be redeemed with a little patience. Still beats being stuck in a dead end because of wrong skilling. The very inspecific nature of grinding quest goals (“go forth and bring me x units of good y”) can also be used to give the player freedom. There’s no rule that the orcs from which you take the required 65 orc noses can only be found in one confined area, requiring the player to run around until they respawn. There may be more than enough orcs spread over a number of areas, meaning that the quest will also lead to some freeform exploration. These factors can also be used in combination. It may even be a mission important to the main quest line where the player is tasked to bring the archmage 50 volcanic gems – yes, they can be mostly found in lava dungeons or as treasures in warlock tombs, but if the player misses some of those or does not have the right party to deal with the undead warlocks, orc warriors also drop them regularly because they like them in their rings and amulets. This gives a lot of freedom to the player, again with grinding as the fallback option. Of course, the “option” part is significant here, as in all of these cases – as soon as grinding becomes the only way complete relevant quests, it tends to get tedious and annoying, even with a reward. One thing that is difficult to resolve is the tension between the availability of large, potentially infinite numbers of grinding targets (because with too few, grinding might not fulfill its purpose as fallback option) and the search for optimal play, where grinding as much as possible, if the option presents itself, might be the obvious objective. There are a few tricks to prevent this. One is to have the grinding reward be outside the game’s main rule system. In the example of volcanic gems above, once the player has acquired 50 gems, it doesn’t matter if he could slay orcs on and on, as the quest objective is achieved. In case of XP grinding, a common method is to reduce the amount of XP an encounter yields relative to the character level. Another way could be to have monsters flee if the party’s average level is above a certain threshold – makes sense, because which orc marauder in his right mind would go to battle with a group of powerful heroes armed to the teeth? Gold (yes, almost as obvious) – not only by battle, but by trading with common goods (not equipment). If sophisticated enough, this might be a game within the game. Finally, there are two grinding implementations which I strongly recommend to avoid. The first is blocking story progress with a grinding quest. I’m not necessarily saying main quest progress (see volcanic gem example above), but if you’ve been foreshadowing a great revelation or if the player has finally reached the mystical castle of the genie king, something like “yes, you may enter, but only after you’ve spent the next few hours collecting 82 imp tails” is really, really bad for motivation. The second is RNG grinding. Random number generation is there to make things a little more unpredictable and therefore exciting, but the keyword here is “a little”. If the outcome of a battle depends solely on which spell the enemy chooses to cast in the first round; if a level-up can provide the character with 10 or 100 additional hit points; if a trap has an equal chance of killing the character outright or doing virtually no damage; in short, if the player is regularly required to grind using the process “save game / load game”, then something is very, very wrong.